New Delhi, the 18th July, 2017. 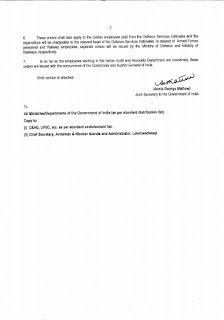 Subject: Implementation on the recommendations of 7th Central Pay Commission - Grant of Island Special Duty Allowance to the Central Government employees posted in the Andaman & Nicobar Group of Islands and Islands of Union Territory of Lakshadweep. 2. The term ‘Basic Pay’ in the revised pay structure means the pay'drawn in the prescribed level in the Pay Matrix but does not include any other type of pay like Special Pay, etc. 3. 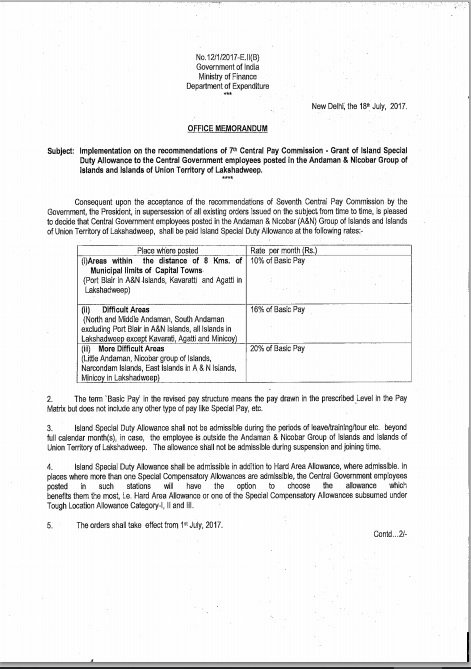 Island Special Duty Allowance shall not be admissible during the periods of leave/training/tour etc. beyond full calendar month(s), in case, the employee is outside the Andaman & Nicobar Group of Islands and Islands of Union Territory of Lakshadweep. The allowance shall not be admissible-during suspension and joining time. 4. Island Special Duty Allowance shall be admissible in addition to Hard Area Allowance, ‘where admissible. In places where more than one Special Compensatory Allowances are admissible, the Central Government employees posted in such stations will have the option to choose the allowance which benefits them the most, i.e. Hard Area Allowance or one of the Special Compensatory Allowances subsumed under Tough Location Allowance ‘Category-I, II and III. 5. 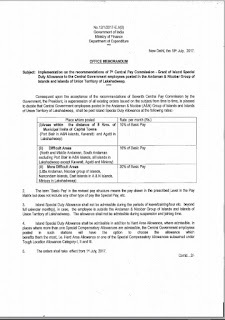 The orders shall take effect from 1st July, 2017. 6. These orders shall also apply to the civilian employees paid from the Defence Services Estimates and the expenditure will be chargeable to the relevant head of the Defence, Services Estimates. In respect of Armed Forces personnel and Railway employees, separate orders wilt be issued by the Ministry of Defence and Ministry of Railways, respectively. 7. 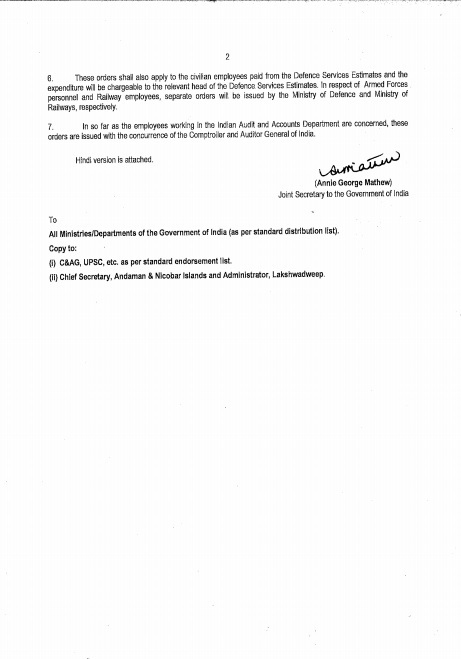 In so far as the employees working in the Indian Audit and Accounts Department are concerned, these orders are issued with the concurrence of the Comptroller and Auditor General of India.